In 1946, on the eve of full independence from Britain, the Government of India announced the establishment of a committee to recommend necessary steps to ‘improve facilities for research and training in indigenous systems and generally to increase their usefulness to the public’ (p. 9). The committee began by drawing up several sets of questionnaires to survey medical practitioners of all persuasions throughout the country, as well as provincial governments, teaching institutions and pharmacies on the subject of medical provision. In the end the committee took oral testimony from 322 practitioners of various forms of medicine and summarized the oral testimony in an appendix to the report. There are quite a few interesting mentions of yoga in this report (published in 1948), emphasizing how yoga’s status as a health intervention in mid-twentieth century was in a period of exploration and transition. Here, I will share the transcriptions of a piece of evidence which may be of interest to may contemporary yoga practitioners - Tirumalai Krishnamacharya (1888 –1989), the teacher of T. K. V. Desikachar (1938-2016), Indra Devi (1899–2002), B.K.S. Iyengar (1918-2014), K. Pattabhi Jois (1915–2009) amongst other highly respected yoga teachers who have been very influential in the global popularisation of yoga. Q. What are the advantages of Yogic treatment over other methods? i) to preserve health (Arogyam) and to prevent ill-health. ii) to secure light and free movement of limbs (Angalaghavam) and to make the body keep light. iii) To obtain freedom from injury due to extremes of heat and cold and to withstand the ‘duals’ (Dwandwa) such as love and hate, pleasure and pain etc. But the real object of practicing the Asanas, he said, is to secure a posture suitable for meditation. Q. What diseases do you treat by the Asanas? A. The diseases that are treated here are classified into three kinds viz. i) Manasa diseases relating to the mind. ii) Aindriya diseases relating to the senses. Iii) Shareera or physical diseases relating to the different organs and tissues of the body. Q. How do the Asanas act in these diseases? iii) Nissarana – by promoting elimination. c) And, standing exercises for the strong and healthy. Demonstrations by several persons of different ages and strength in a military style like drill are to be discouraged. 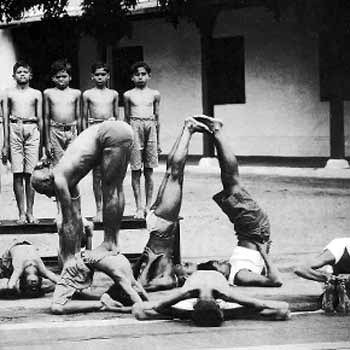 Although in the demonstrations given by several boys and girls, the methods of military drill are adopted, regulation of breath is most important for all these postures. Q. Is it a new method of yours? A. No. They are of Patanjali. Q. Please explain Prathipaksha and the different processes? A. Pratipaksha means converse process. The commentator explains the three process, viz. iii) Viloma – converse direction to both (i.e.) the opposite direction. In performing the Asanas, the action of the muscles in various directions should be carefully observed and in order to counteract any undue strain on any part of the body the converse processes are also to be practised. One particular Asana is to be considered as the converse of another. Report of the Committee on Indigenous Systems of Medicine Vol. II Report and Recommendations Published by the Ministry of Health, Government of India, 1948, pp. 98-100.